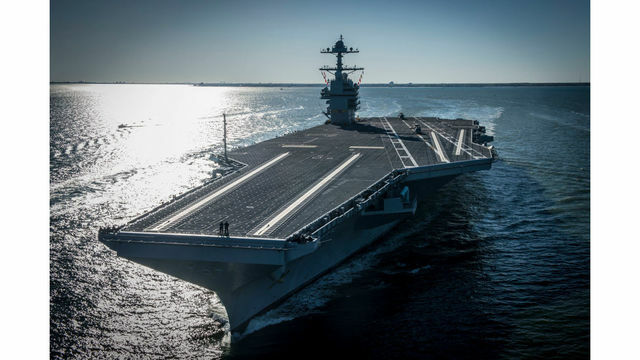 NORFOLK, Va. (AP) — The nation's newest aircraft carrier returned to a Virginia shipyard Sunday for a year of planned upgrades and fixes, marking the next phase in the development of the Navy's most advanced and scrutinized warship. The electromagnetic launch system also drew criticism from President Donald Trump, who told Time magazine last year that the system "costs hundreds of millions of dollars more money and it's no good." The Navy has declined to comment on the president's statement. But officials said that the Ford has launched and recovered nearly 750 aircraft so far and will support "full intensity" operations by its first deployment. The ship's radar and weapons elevators will also be upgraded during its stay at the shipyard. "No nation on earth can match the capability of USS Gerald R. Ford; a class of ship which will lead our Navy well into the 21st century," Rear Admiral Roy Kelley, Commander of Naval Air Force Atlantic, said in a statement Sunday.